The percentage of Americans who say they are in the lower-middle or lower class has risen from a quarter of the adult population to about a third in the past four years, according to a national survey of 2,508 adults by the Pew Research Center. Not only has the lower class grown, but its demographic profile also has shifted. People younger than 30 are disproportionately swelling the ranks of the self-defined lower classes.1 The shares of Hispanics and whites who place themselves in the lower class also are growing. Among blacks, the story is different. The share of blacks in the lower class has not changed in four years, one of the few demographic groups in which the proportion in the lower classes did not grow. As a consequence, a virtually identical share of blacks (33%) and whites (31%) now say they are in the lower class. When it comes to political affiliation, more Democrats than Republicans place themselves in the lower classes, but Republicans saw a sharper rise over the past four years. Some 23% now call themselves lower class, up from 13% in 2008. Among Democrats, 33% now call themselves lower class, compared with 29% in 2008. The survey finds that hard times have been particularly hard on the lower class. 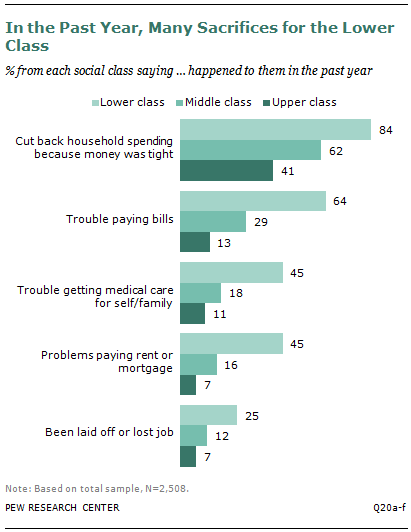 Eight-in-ten adults (84%) in the lower classes say they had to cut back spending in the past year because money was tight, compared with 62% who say they are middle class and 41% who say they are in the upper classes. Those in the lower classes also say they are less happy and less healthy, and the stress they report experiencing is more than other adults. 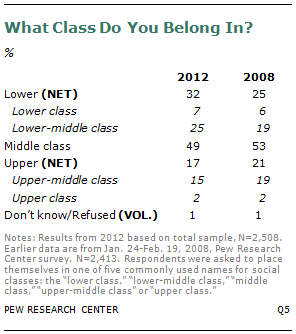 To measure social class, the Pew Research surveys in 2012 and 20082 asked respondents this question: “If you were asked to use one of these commonly used names for the social classes, which would you say you belong in: the upper class, upper-middle class, middle class, lower-middle class or lower class?” Few respondents in either survey placed themselves in the “lower class” or “upper class” categories. So for this report “lower class” constitutes those who placed themselves in the lower or lower-middle class. Those who identified themselves as upper or upper-middle class are combined to form the “upper class” group. About a third of all adults (32%) now say they are in the lower class, up from 25% in a Pew Research Center survey conducted in early 2008. This increase can be seen to one degree or another in most—but not all—demographic groups analyzed for this report. But it is particularly striking among young adults, who by their own self-definitions have moved into the lower classes at nearly twice the rate for the population as a whole. Fully 39% of adults ages 18 to 29 now say they are in the lower class, a 14 percentage point increase since 2008. Four years ago, young people were no more likely than other age group to identify as either lower or lower-middle class. Today, about twice the share of young people than adults ages 65 and older say they stand on the bottom rungs of the social ladder (39% vs. 20%). Larger shares of whites (31% vs. 23%) and Hispanics (40% vs. 30%) today than in 2008 also say they are in the lower class. In contrast, there has been no increase in the proportion of blacks who identify as lower class (33% in both surveys). As a result, whites today are no more likely than blacks to say they are in the lower class (31% vs. 33%), a change from four years ago when a significantly larger share of blacks identified with the lower classes (23% vs. 33%). The survey also found that a good education offered some protection from falling into the lower class. Among those adults who attended college but did not graduate, the share who place themselves in the lower class increased by 12 percentage points to 36% in the past four years. At the same time, the proportion with no more than a high school diploma who say they are in the lower class rose by 9 points to 41%. The increase in the proportion who say they are in the lower class has been somewhat more uniform in other core demographic groups. For example, roughly a third of all men (34%) and women (31%) say they are in the lower class, an eight- and seven-percentage point increase, respectively, from 2008. Nearly twice the proportion of Republicans now place themselves in the lower class than did so four years ago (23% vs. 13%). The share of political independents who say they are in the lower classes also increased to 37%, a 10 percentage point increase over 2008. About a third of all Democrats say they are lower class (33%), compared with 29% four years ago, a change that is not statistically significant. While the share of Republicans who place themselves in the lower class has increased, the GOP is still underrepresented among the lower classes relative to their numbers in the overall population. Overall about 16% of the lower class identifies with the Republican Party, while the GOP makes up about 22% of the population. In contrast, the percentages of the lower class who identify as Democrats and independents mirror their overall proportions in the country as a whole. A third (34%) of the lower class are Democrats and 43% are independents, while nationally a third of adults (33%) say they are Democrats and 38% are independents. The survey also finds that the proportion of self-described conservatives who are in the lower class also has surged, rising from 19% in 2008 to 32% in the latest Pew Research survey. In contrast, the proportion of moderates increased from 24% to 30%. A third of all liberals (33%) placed themselves in the lower class, while 29% did in 2008, though this change was not statistically significant. As a result of these shifts, roughly equal shares of conservatives (32%), moderates (30%) and liberals (33%) say they stand on the bottom rungs of the social ladder now. Are either the Republicans or Democrats the “party of the poor?” Some have claimed that the Democrats mostly favor the poor and disadvantaged over the interests of other Americans. Those in the lower class disagree—and so do adults in the middle and upper classes. Overall, only about three-in-ten adults in the lower, middle and upper classes say the Democrats favor the poor. In contrast, only about 3% of all adults say the GOP is primarily concerned about needs of Americans living in poverty. Another set of survey questions underscores the difficulty that many of those in the lower class face moving into the middle or upper classes. At the same time, these results document considerable movement up the social ladder among those raised in lower-class households. To measure social mobility, the survey asked two questions. The first one asked respondents which class they currently belonged to: the lower, lower-middle, middle, upper-middle or upper class. A follow-up question asked where they would place their families when they were growing up. By comparing respondents’ answers to the two questions, it is possible to see who has moved up the social ladder from where their families stood, who moved down and who stayed in place. The findings indicate that a majority of those in the lower class (61%) were raised in families that were themselves lower class; in other words, they have made no progress up the social ladder from where they started. Roughly four-in-ten (38%) have experienced downward mobility since their childhood: 26% who say they were raised middle class and 12% who say they grew up in upper-class families. In contrast, 44% of those in the middle class say their parents were middle class and an additional 40% say they were from a lower-class background. 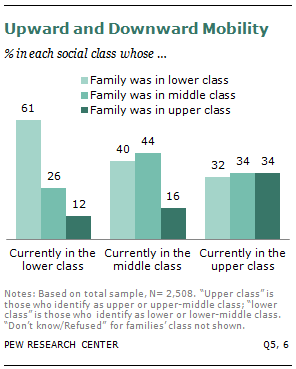 About a third (34%) of upper-class adults say they were raised in upper-class households. But about two-thirds say they had risen from humbler backgrounds: 34% say their families were middle class, while a roughly equal share (32%) says they were raised in lower-class families. According to the survey, about six-in-ten (63%) adults in the lower class say they are less financially secure today than they were 10 years ago. In contrast, about four-in-ten middle-class adults (42%) and a quarter (24%) of those who say they are in the upper class say their financial situation is more precarious now than it was a decade ago. Their experiences in the past decade are echoed in their views of the current economy. About half (52%) of those in the lower classes say the current economy is “poor.” In contrast, only about half that share of those in the upper class (27%) and 34% of middle-class adults have a similarly downbeat view. The lower class is equally gloomy when looking ahead. About six-in-ten (58%) say they have little or no confidence that they will have enough money to live on in retirement. About three-quarters (77%) of those in the lower class also say it’s harder to get ahead today than a decade ago. 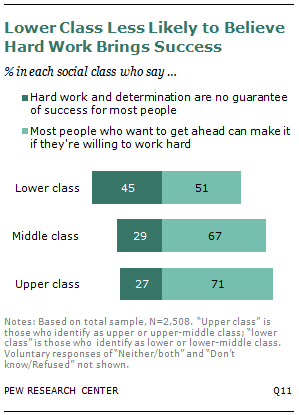 The lower class also is sharply divided over whether hard work is the path to success. About half (51%) agree that “most people who want to get ahead can make it if they’re willing to work hard.” But nearly as many (45%) hold the contrary view that “hard work and determination are no guarantee of success.” In contrast, big majorities of the middle and upper classes (67% and 71%, respectively) endorse the view that hard work is still a viable path to success. By significant margins, those in the self-identified lower classes say they are less satisfied than others with their family life, housing, education and finances. On many responses, the gap between the lower and middle classes is much larger than that between the middle and upper classes. About four-in-ten (42%) people in the lower class say they are satisfied with their personal financial situations, compared with 72% of those in the middle class and 85% in the upper class. In regard to housing and education, about seven-in-ten in the lower class express satisfaction, compared with about nine-in-ten in both the middle and upper classes. The difference among classes extends to their family lives as well. About eight-in-ten (81%) in the lower class are satisfied with this aspect of their lives, compared with nearly 95% of those in the other classes. Wider gaps emerge when measuring only those who are “very satisfied.” Only 13% of lower-class adults say they are “very satisfied” with their financial situation—less than half the rate of other Americans. About one-third of middle-class adults (32%) say they are very satisfied with their finances, and roughly half (49%) of the upper class say the same. adults who say they are “very” satisfied” is 34%, compared with 61% of the middle class and 79% of the upper class who express strong satisfaction with their education. The gap in strong satisfaction also exists in people’s family lives. About six-in-ten (57%) adults who said they were in the lower classes are very satisfied, below the levels for the middle class (78%) and the upper class (85%). Some differences emerge within the lower class, as well. On the issue of housing, 87% of owners are satisfied, but just six-in-ten (62%) renters agree. About three-in-four whites who say they are lower class (78%) are satisfied with their housing, a higher share than Hispanics (65%). Among blacks who place themselves in the lower classes, 69% are satisfied. A similar pattern holds for views on their education. Among the lower class, about nine-in-ten college graduates (92%) say they are satisfied with their education, compared with 67% of those who do not have bachelor’s degrees. More than twice as many college graduates (73%) as non-college graduates (27%) say they are “very” satisfied on this measure. Three-quarters of lower-class whites, 69% of blacks and only 57% of Hispanics say they are satisfied with their education. Additionally, education is the one measure in which an age gap emerges. Among the lower class, about eight-in-ten (78%) adults ages 50 and older are satisfied with their education, compared with 66% of younger adults. The survey also found that family satisfaction varies somewhat by race and ethnicity. Nine-in-ten blacks (90%) in the lower class say they are satisfied with their family lives, compared with about eight-in-ten Hispanics (83%) and whites (79%). Those in the lower class are much more likely than those in the other classes to have faced economic hardships in the past year, such as cutting back household spending in general; having trouble paying for rent, mortgage, medical care or bills in general; or having been laid off or lost their job. Just 11% of lower-class adults said none of these situations had occurred in the past year. Middle-class adults are three times as likely (33%) and upper class adults five times as likely (54%) to have escaped these problems. One-in-three (34%) people in the lower class faced four or all five of the problems asked in the survey, compared with 10% of middle-class adults and just 3% of the upper class. With each of the five experiences, those in the lower class were at least twice as likely as the upper class and often the middle class to have encountered them in the past year. About eight-in-ten people in the lower class (84%) cut back their household spending, compared with 62% of the middle class and 41% of the lower class. Six-in-ten lower-class adults (64%) had trouble paying their bills, more than twice the rate of the middle class (29%) or the upper class (13%). Fully 45% had difficulty paying for medical care for themselves or their families. Just two-in-ten (18%) middle-class adults and one-in-ten upper-class adults (11%) faced a similar problem. The same gap exists for problems with rent or mortgage—45% of the lower class said they had trouble paying for housing in the past year, as did 16% of the middle class and 7% of the upper class. One-in-four people (25%) in the lower class lost their job in the year prior to the survey, twice the rate of the middle class (12%) and about three times the rate of the upper class (7%). Some demographic groups in the lower class fared differently than others in the past year. Men were twice as likely as women to have faced none of the five problems. Those ages 65 and older were also more than twice as likely as other age groups to have avoided those hardships. Non-college graduates, unmarried adults and renters are also somewhat more likely than college graduates, married adults and homeowners to have had two or more problems in the last two months. On each of the five problems, adults 65 and older said they had been better off than younger adults in the lower class. On average, they experienced about one less problem than other groups. With one exception, college graduates in the lower class were less likely to have faced these problems than those without a college degree. The trouble in the last year that affected college graduates equally as non-college graduates was losing a job, which happened to about one-in-four people in both groups. Women fared worse than men in the lower class in three of the five categories. They were more likely than men to have had to cut back on spending, had trouble paying the bills and had trouble paying for medical care. They were not significantly different when it came to paying rent or mortgage or losing a job. Overall, those who say they are in the lower or lower-middle class are less happy, less healthy and more stressed than other social classes. Compared with the upper class, the lower class is four times as likely to be in subpar health, three times as likely to be unhappy and twice as likely to be frequently stressed. Four-in-ten (40%) lower-class Americans say their health in general is only fair or poor. Only about half as many middle-class Americans say the same (22%) and just one-in-ten (10%) in the upper class concur. In the lower class, two-in-ten (19%) are in “excellent” health, compared with three-in-ten (32%) in the middle class and roughly four-in-ten (44%) in the upper class. These results are largely unchanged from a 2008 Pew Research study on the social classes. Not surprisingly, older people in the lower class register less satisfaction with their health. Among those ages 50 and older, 51% are in “only fair” or “poor” health, while 41% are in good health and 7% are in excellent health. By contrast, one-third (34%) of people younger than 50 are in only fair or poor health, and one-quarter (26%) register excellent health. In addition, men in the lower class are more likely than women to say they are in “excellent” health (23% vs. 14%). There is little significant difference among races and ethnicities. About one-in-three people in the lower class (31%) say they are not too happy with how things are in their life, more than the middle class (18%) and three times as much as the lower class (10%). And only two-in-ten say they are “very happy,” compared with three-in-ten in the middle class (32%) and four-in-ten in the upper class (42%). Inside the lower class, those ages 50 and older (41%) are more likely than younger generations (26%) to say they are “not too happy,” although similar percentages say they are “very happy” (19% of those 50 and older and 21% of those younger than 50). Whites are less likely than minorities to say they are “very happy” with their lives. Just 17% of whites in the lower class say this, which is less than blacks (28%) and Hispanics (29%). About six-in-ten (58%) people in the lower class say they are “frequently” stressed. Only four-in-ten in the middle class (37%) and three-in-ten in the upper class (29%) say the same. Whites in the lower class were particularly likely to say they were frequently stressed. About two-thirds of whites (65%) are frequently stressed, significantly more than blacks (46%) and Hispanics (37%). Adults ages 18 to 64 are more likely to be often stressed than older adults (61% vs. 31%). About three-in-ten employed lower-class adults (28%) say they are dissatisfied with their jobs, and they are several times as likely as those in other classes to say that. About seven-in-ten (71%) say they are satisfied, and an overwhelming 93% of the middle and upper classes express job satisfaction. Employed women in the lower class are more likely than men to express dissatisfaction (35% vs. 23%). Employed adults in the lower class ages 18 to 49 are twice as likely as those 50 and older to say they are not satisfied with their jobs (32% vs. 16%). People in the self-described lower class also are much more likely than others to say they are not advancing in their careers. 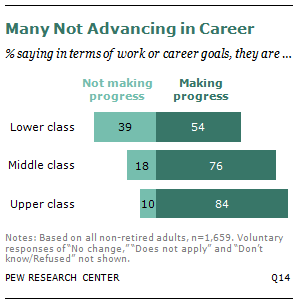 Among those who are not retired, four-in-ten in the lower class (39%) state that they are not making progress in their work or career goals. This is about twice the rate of those in the middle class (18%) and nearly four times the rate of those in the upper class (10%). Among those who say they are in the lower class, women are twice as likely as men to say they are not making progress. About half (53%) say they are not meeting their career goals, compared with 26% of men. Additionally, about six-in-ten (59%) non-retired adults ages 50 and older say they are not making progress, as do 32% of those younger than 50. Similar proportions of each class are currently employed, but the lower class has more part-time workers who would prefer to work full time than the other classes and also higher rates of unemployed people looking for work. In the lower class, 37% of adults say they do not have a job, compared with 36% of the middle class and 30% of the upper class. But three-in-ten (31%) of those in the lower classes who are not employed are currently looking for work, while two-in-ten (21%) of the middle class and 16% of the upper class are not employed and looking for a job. About two-in-ten (17%) in the lower class work part time, roughly equal to other classes. However, part-time workers in the lower class are much more likely to want full-time employment than others. Eight-in-ten (82%) say they would prefer to be working full time, while only 36% of part-time workers in the other classes say they want a full-time job. There is a mixed verdict when people are asked about their children’s future standard of living. 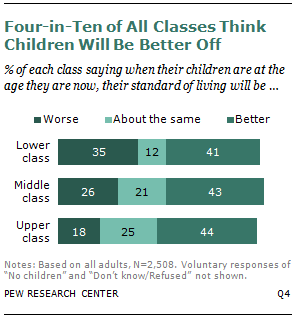 Four-in-ten lower-class adults (41%) expect their children to be better off than them at their current age, which is similar to the percentage of the middle class and upper class. However, roughly one-third of the lower class (35%) believes that their kids will be worse off than they are. That share is greater than the middle class (26%) and about twice as large as the upper class (18%). Blacks and Hispanics in the lower class are much more optimistic about the next generation than whites. Hispanics in the lower class are much more likely to think their children will be better off than worse off, by 63% to 19%. Blacks are in agreement, 56% to 25%. However, many whites in the lower class are pessimistic. Just three-in-ten (31%) think their children will be better off, and four-in-ten (42%) think their future standard of living will be worse than theirs.